A short-lived perennial that has definitely caught our attention. Impossibly glossy green foliage appears as if someone applied a layer of lacquer. The first season, it forms a rosette of these beautiful divided leaves. The following season the whole plant rises up to bloom to 3′ tall. 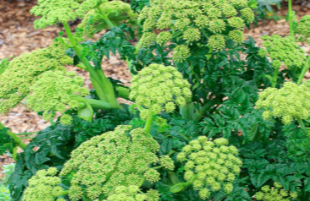 Giant umbels of shocking acid green are produced. A beacon to pollinators, flower arrangers, garden designers and everyone who has impeccable taste. Remains in bloom for up to two months. Average lifespan 3-4 years. Full sun to part shade in rich soil with regular summer water. Sets a LOT of seed.